Using the landscape of the Museum as a test site, the V&A invited nineteen architects to submit proposals for structures that examine notions of refuge and retreat. Responding to specific locations in the Museum, the architects explored themes such as study, work, play, performance and contemplation. Seven of the proposals were then selected for construction at full-scale. These projects promoted an attitude to architecture where to 'dwell' meant something more than simply to find shelter. Each building invited the participation of the viewer. These immersive environments reawakened people's ability to inhabit architectural space on both a physical and an emotional level. The experience of being in, or passing through, a space is a fundamental architectural concept. Two bold, angular interventions are placed on a staircase, forcing visitors to dwell momentarily in an area that is normally used as a simple transition from one space to another. The dramatic, sharp-turning angle at the top of the stairs would induce in the visitor a sense of claustrophobia and disorientation. An MDF model of a staircase and landing painted white. The staircase is divided by two black angular pieces of MDF and there are five black rectangular plinths positioned on the landing. 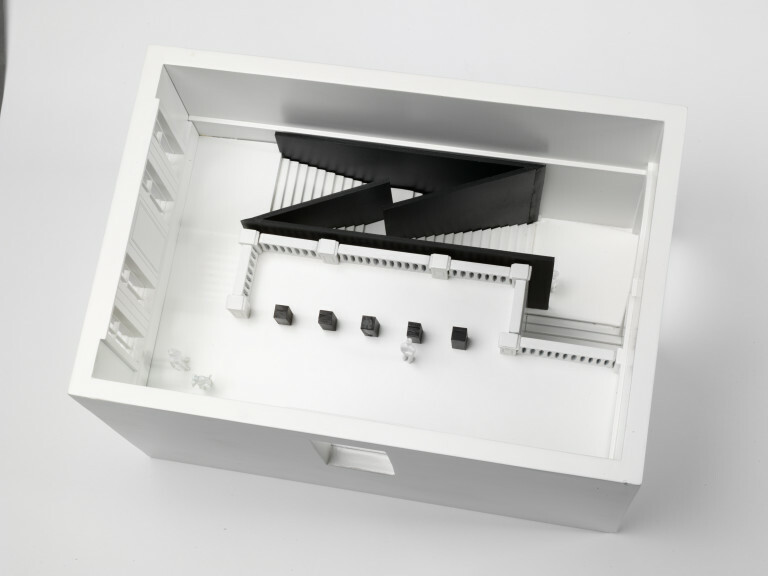 The model includes details such as door and window openings, a balustrade, and four white plastic scale figures. 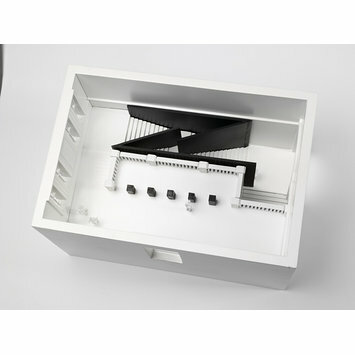 Model for 1:1 Architects Build Small Spaces exhibition, 'Penrose Stairs', by Productora, Mexico, 2009.